If you are missing one or more teeth, you may be interested in tooth replacement options. While you could go the route of traditional dentures or dental bridges, these options are not always completely permanent. Additionally, dentures easily use their shape and move around or slip. However, dental implants from your Worth, IL dentist give you the most natural looking and functional teeth possible. Dental implants use a biocompatible titanium post, called a fixture, implanted surgically into the jawbone to replace a missing tooth’s root. As it heals, the fixture integrates into the bone, becoming part of it. Due to its design, the implant is the most sturdy and permanent tooth replacement option. Once your Worth dentist attaches the tooth’s replacement, a porcelain dental crown, to the fixture, your new tooth will function and feel exactly like a natural tooth. Single Tooth Replacement: Single tooth replacement uses one fixture implanted into the jawbone beneath a missing tooth to replace the tooth’s root. A dental crown sits on top of the fixture to replace the tooth itself. Multiple Tooth Replacement: Similar to a traditional dental bridge, multiple tooth replacement uses two fixtures implanted on either side of a gap to anchor a row of replacement teeth. While traditional bridges use healthy teeth to hold the restoration in place, implants allow the natural teeth’s structures to stay intact. Implant-Supported Dentures: Traditional dentures use suction to stay in place and are notorious for easily losing their shape, becoming loose and potentially sliding or moving. Implant-supported dentures use four or more implants spaced throughout the arch to give a permanent or removable denture a foundation on which to sit. Since they are a permanent addition to your smile, you may care for your dental implants the same way as you would care for your teeth. Be sure to brush at least twice daily, replacing your toothbrush when it begins to show signs of wear. Floss at least once a day. Use a different strand of floss for each quadrant of your mouth to cut down on the spread of bacteria. Most importantly, see your dentist at least twice a year for regular dental examinations and cleanings to keep your natural teeth and implants alike clean and healthy. For more information on replacing your teeth with dental implants, please contact your dentist at All Smiles in Worth, IL. 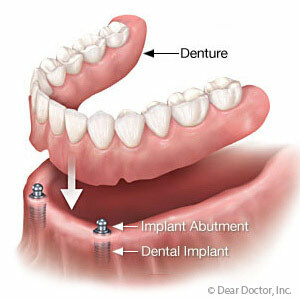 Call (708) 448-0333 to schedule your consultation for dental implants today!